Last Tuesday I decided to treat Mr C, he’d worked all weekend and the stress was really showing. The work itself is very stressful anyway but then throw in WW3 with our 2 little boys fighting all weekend and well – it’s enough to put any normal person in a padded cell!! So I thought about going somewhere upbeat with a lively atmosphere to lighten the mood and knew Jamie’s would be the good for it. We haven’t been for a while but as I predicted it was busy and buzzing – with lots of happy drinkers and diners. It’s such a vibrant place, the bar is right in front of you as you enter; so you can enjoy a drink whilst you wait for your table. There’s multicoloured glass tiles to either side of the bar, bright chairs and lots of excellent lighting – which adds to the great ambience here. We were seated quickly enough and the waitress was really friendly. The buzz of the bar continued into the restaurant and both me and Mr C were happily surprised at just how many people there were. We ordered a bottle of Primitivo, this is a good smooth, rounded and easy drinking red at a good price (£17.95 a bottle). 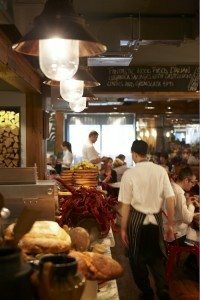 After looking through the menu and getting a little friendly advice, we decided to have 3 sharing starters – crispy porcini mushroom arancini, sweet chilli mini peppers and the worlds best olives on ice. There is an abundance of choice at Jamie’s with something for everyone; there’s 5 different types of bruschetta, single or sharing planks with or without cured meats, a range of breads, salads and other tempting dishes like crisp squid. Our starters arrived, all looking vibrant and screaming “eat me” – where to start? I decided to put a bit of everything on my plate but before I could even finish doing so – Mr C was tucking into a risotto ball! 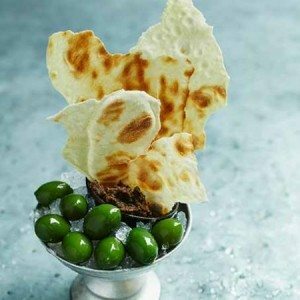 The olives looked so tempting, laying on a bed of crushed ice and accompanied by a black olive tapenade with tall shards of music bread. This bread reminds me of a poppadom without the oil and is great to smother in tapanade. The green olives are full, firm and have a creamy taste to them…..I haven’t tried all the Olives in the world to be sure that they’re the “best” but I can say they are very good and very moreish. Next for the risotto balls – the casing is crispy with a soft risotto/mozzeralla centre; with the flavour of the porcini mushroom really coming through. 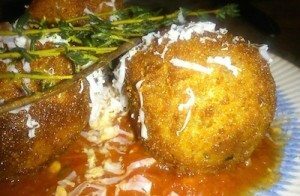 Each of the 3 balls were sat on a bed of arrabbiata – a slightly spicy tomato sauce and this really is a “wicked combo”. This is a great fresh and tasty dish with all the flavours really complimenting eachother. Three very nice mini starters and now we’re looking forward to our mains. You’re literally spoilt for choice on the mains, with over 9 choices on the pasta menu with an excellent balance between meat, fish and vegetarian choices. Four of these options can be gluten free and you can get a small or a large portion should you wish to have a different main and then have pasta on the side. 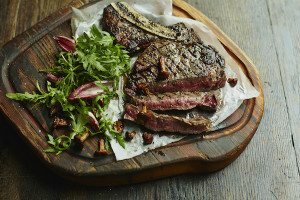 On the mains menu there’s free range chicken with a wild mushroom sauce, lemony rocket, crostini and parmesan, lamb chops, calves liver with bacon, burgers or even lobster alforno! And, let’s not forget, we can combine these with different sides depending on your mood and how hungry you are. Next time I’m having the free range chicken dish with a side of funky chips or maybe a small portion of porcini fettuccini – yum! Mr C has chosen the 10oz bone-in rib-eye steak and I thought I’d try something more traditional and chose the italian style steak-frites. Our mains arrive in good time, my steak is very thin and very well seasoned. 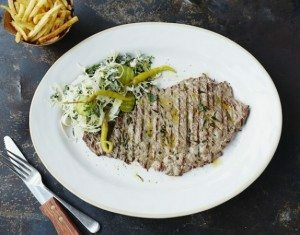 This is a typical italian steak and comes cooked well, the thin spicy chips are simply delicious (a must have again) and both combine well with the crunchy kale slaw and whole green chilli’s. I really like the simplicity of this dish and a great change from my normal choice of steak – a medium fillet! The crunchy kale slaw is really good, not too creamy as they use yogurt and there’s hints of lemon and mint. Mr C’s rib-eye is looking all of it’s ten ounces, he likes it medium rare and Jamie’s certainly delivered a delicious cut of beef. .. And if that wasn’t enough, the portobello lemony mushrooms were absolutely delicious and the triple baked thick chips – incredible! We are pretty full but the desserts sound too good to miss too.. I mean, who wouldn’t be tempted by amalfi lemon meringue cheese cake, chocolate and hazelnut arctic roll, chocolate, pear and honeycomb pavlova or even a sour cherry and almond tart?? I couldn’t resist the epic brownie and Mr C wanted some ice cream – caramel and vanilla topped with honeycomb. Epic is a great word for this fudgy brownie, it’s soft, sticky and guey but at the same time not to heavy. 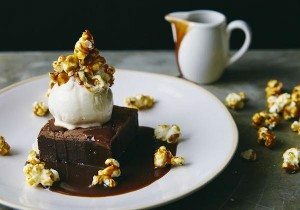 The vanilla ice-cream is gorgeous and the popcorn is an excellent addition – a must have dessert. Mr C, a big ice-cream fan is equally pleased with his ice-cream and I even have to kick him under the table for a mouthful! If your stuck for somewhere to go and want a lively atmosphere, good food and friendly service then I would highly recommend Jamie’s for a group, family or couples lunch/dinner.